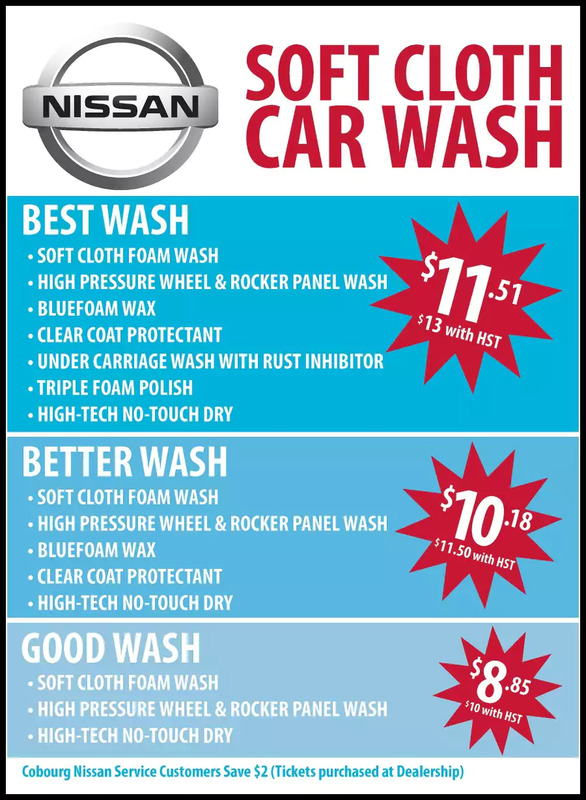 Why Cobourg Nissan’s Wash? Simply put, it’s the Best, Safest and Fastest Car wash around! Cobourg Nissan’s Envirosoft Foam Wash combines individual components that clean areas of your vehicle that touchless can’t do, but it also takes attention to detail. Our dedication to perfecting these components, chemical application, wash equipment, wheel cleaning, extra service applications, wash controls and drying help make your experience the best it can be! SuperFlex Envirosoft Foam Brushes are the gentlest, safest and most effective brushes you’ll find. Their reliable performance has set the standard in the industry by providing excellent wash consistency at the highest of line speeds. They spin at 120rpms and do not absorb water therefore they do not retain and dirt or debris which means your vehicle is cleaned with feather light clean brushes every time! Have you ever tried to wash your car in your driveway using just water and not touching the vehicles surface? Didn’t work did it! Touchless washes have to use strong detergents in order to remove dirt from your car followed by extremely high pressure water. Does your sunroof or any other seals leak that you know of due to the high pressure water? If your not sure you may even have mold in places like your trunk because the high pressure water got through…. Did you know the reason gas stations use touchless? They are inexpensive and space saving NOT better! The average cost of a touch less wash is $50,000 whereas Brush washes average $500,000. Trust Cobourg Nissan’s car wash! It’s the Best, Safest and Fastest Car wash!